I love this recipe. It’s versatile enough to be made into a pie, or into smaller tarts, or even into a crustless custard, in ramekins. I was a smidge distracted the first time I made this, so was surprised that the filling is really enough for two pies. The filling thickens to a nice smooth consistency, appley in flavor along with the more familiar elements of custard. 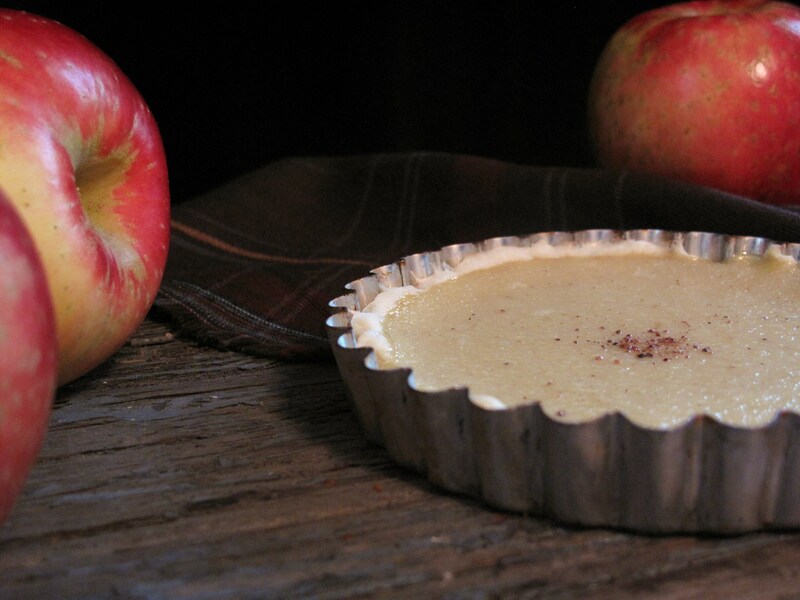 It’s mildly sweet, not overpoweringly so, which lets all the natural flavor of the apple and the bite of the nutmeg shine. All in all, it’s a simple dish that’s easy to prepare, and easy to appreciate. Plus, it’s a great use for some of those autumn apples you might have lying around! 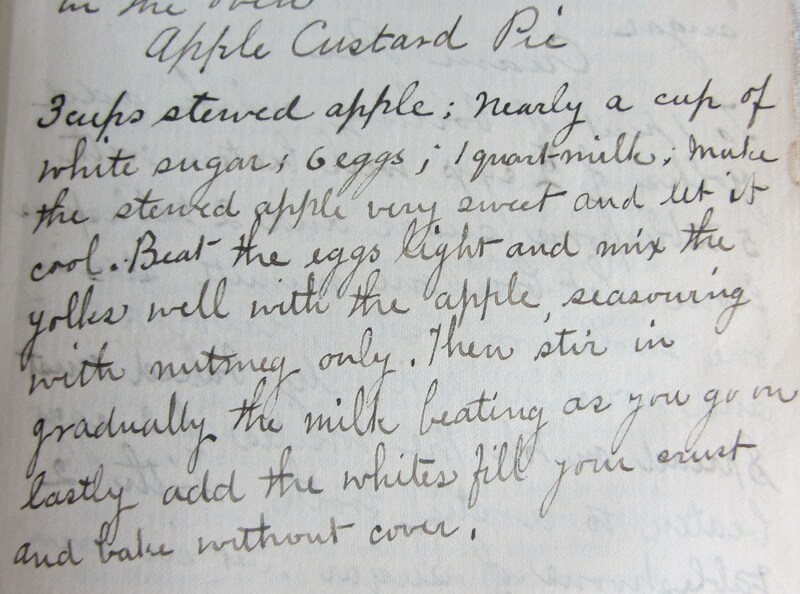 Cook’s Note: I use applesauce in the recipe below to simplify things, but if you have proper orchard apples, stewing them down for this custard is a wonderful use for them. Also, although not listed in the original, I added a splash of brandy and a dash of vanilla. Feel free to play, and make the recipe your own! Make the crust by cutting the butter and shortening into the flour, then add the sugar and salt. Pour in just enough water to bring the dough together, and try not to overwork it. Roll out to about 1/4″ thickness, then line two pie pans with it. Crimp the edges decoratively, and prick the bottoms of the pies all over with a fork (this keeps the dough from bubbling up). Pour the applesauce into a fine sieve, and allow any extra water and juices to drain out; this will help the custard filling set up nicely. Place the drained applesauce in a large bowl, and add the sugar, yolks, and nutmeg. Beat thoroughly, and add the milk, followed by the whites, beating all the while. Pour the custard into the prepared pie pans; any extra can be poured into ramekins or other oven-safe dishes. Bake for around 45 minutes, or until the center of the pies are set. Remove from the oven, let cool, sprinkle with a little decorative nutmeg, and enjoy! Sounds amazing. I could see adding some apple slices for little bursts of additional fruitiness. Or almond! Or marzipan! Both of my grandmothers use to make apple custard pies and they both used dried apples that they would dry late in the fall every year and store in sealed jars or in the freezer. They were amazing pies. I never got one grandmothers recipe but she sometimes would also use applesauce. Thanks for this. Oh, what a neat connection to have! I’ve wanted to try preserving my own apples for years, but never quite seem to get to it with the business of summer. I hope the recipe brings back some good memories!